PULLMAN, Wash. – New technology being developed at Washington State University could help save amphibians around the world from a deadly fungal pathogen. Batrachochytrium dendrobatidis or Bd is a particularly nasty type of fungus that attacks the skin of frogs and salamanders. Over the past 30 years, the highly lethal pathogen has caused the catastrophic decline or extinction of at least 200 species of frogs on six different continents and has been implicated in the unexplained disappearance of Central American salamanders as well. One of the major challenges in preventing the spread of Bd is the lack of an effective method to predict where outbreaks may occur. In a recent study in the journal Diseases of Aquatic Organisms, WSU scientists demonstrate for the first time that environmental DNA (eDNA) could provide a viable solution to the problem. 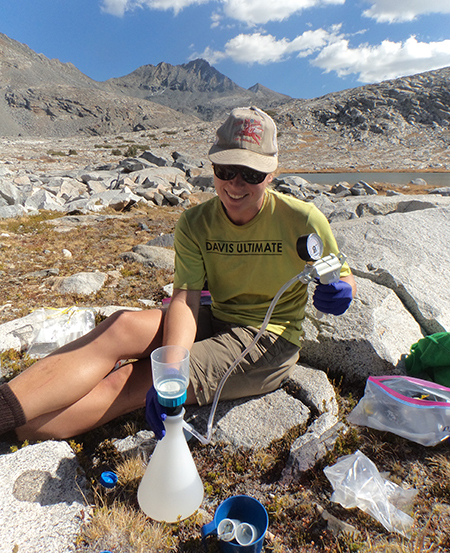 Colleen Kamoroff collects eDNA samples for analysis in Sequoia Kings Canyon National Park. Photo by Jessica Thompson. Colleen Kamoroff, a former WSU natural resources graduate student, and her advisor Caren Goldberg, an assistant professor in the WSU School of the Environment, used eDNA to detect Bd one month before the pathogen impacted populations of mountain yellowed-legged frogs in Sequoia Kings Canyon National Park in California. Their research demonstrates eDNA could provide an early signal of where Bd die-offs may occur which would help conservationists take action to save amphibians afflicted by the pathogen. 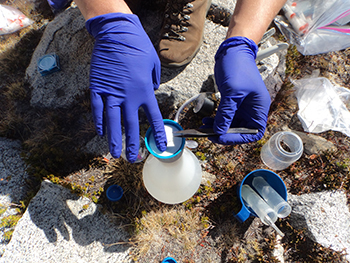 Kamoroff originally went to California’s Sequoia Kings Canyon National Park in 2015 to determine whether eDNA techniques can be used to detect when non-native fish had been successfully removed from high alpine restoration lakes. The lakes are home to two federally endangered species of mountain yellow-legged frogs. A month after she collected her samples, mountain yellow-legged frogs at three of the lakes experienced a mass Bd die-off. Taking samples requires a delicate touch. Photo by Jessica Thompson . At their laboratory in Pullman, Kamoroff and Goldberg found Bd in the eDNA samples from all three lakes where there was a die-off but did not detect the pathogen in the eDNA samples taken from the other lakes. Their research demonstrates eDNA could be a promising, non-invasive method to screen lakes and other bodies of water for the presence of Bd. Currently, the only way to test for the pathogen is take skin swabs from afflicted amphibians. Since 2011, Goldberg and WSU colleagues Alexander Fremier and Katherine Strickler have played an instrumental role in bringing eDNA from a proof of concept to a practical tool for species conservation. Today, Goldberg is involved in many eDNA related research projects, several of which involve the detection of Bd. For example, she recently received a National Geographic research grant to go to Panama to look for endangered Golden Frogs and determine how they are being affected by Bd using eDNA. Goldberg is also working with colleagues across the United States to sample lake water to determine whether a pathogen related to Bd that has devastated salamander populations in Europe does not establish itself in North America. Funding for this research is provided by the National Research Conservation Endowment grant from WSU, Yosemite Conservancy.